Jason Robo is a comedic warrior fighting an important quest to reveal that serious matters are fertile grounds for a laugh. A Navy brat with an upbringing butting heads with authority, conditioning that created this rebellious character. From grade school to the Humboldt State University he challenged authority through humorous rants, thoughtful spoken word, impassioned speeches, and in print form. Robo has a solid foundation with studies in the social sciences, politics, economics and journalism. Activist efforts landed Robo in the news from local rags to international publications, sometimes landing him in jail under absurd circumstances. He fought the law and the law dropped the charges. Comprehensive far out views provoked a negative gut reaction from the administration at HSU resulting in a bogus impeachment from chairperson of the HSU’s Associated Students and a subsequent kangaroo court trial resulting in removal from an election for president. 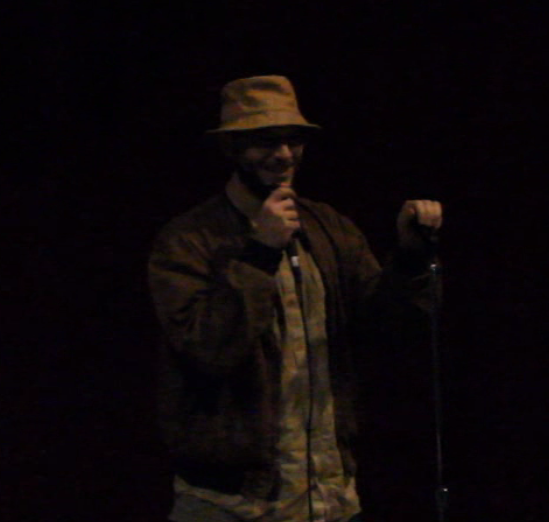 The resulting banishment from campus politics led to setting his sights on various art forms with a focus on stand-up comedy. Robo combats current event views from the “lamestream media” at every turn with radical, as in root, facts of the matters at hand. Robo is inspired by Bill Hicks, George Carlin, Lenny Bruce and Lewis Black, frontiersmen of edgy social-political insights in the comical realities of our society today. Robo hosts a socially-conscious stand-up comedy radio show, "Comedy for a Change". Featuring content from the biggest names in comedy from full albums to custom mixes, airing Saturday from 2-4am on KMUD, Redwood Community Radio. It is also archived for up to two weeks here. His Strictly Revolutionary Comedy Mixes have millions of views on YouTube. Robo also hosts a not-so-trivial trivia nights. He uses his own custom current event related questions relevant to current events and the season, all displayed via flatscreen TV. The multimedia masterpiece features TV/Movie clips, sound effects, images, and songs for participants to identify. As an evolving creature, Robo has also expanded into the art of spinning fire with his 10 and 25-lb steel maces/gadas. His beastly performances have been featured with the fire troupe Circus of the Elements. Original hip-hop and satirical remixes performed at karaoke nights are another outlet for Robo’s talents. With his sights set on dozens of songs to be Robo-fied. His strictly revolutionary touch has been added to the songs “Regulate” by Warren G and “Juicy” by The Notorious BIG.